This is an original glass slide that was sent to a movie theater in Green Bay, WI in 1917 or 1918 to show between films giving current news and events. This glass slide caption is "Without ships the war cannot be won. Every swing of an axe, every cut of a saw may score as heavily as a shot fired from the boys in the trenches." "Shown through courtesy of Joannes Bros. Company - Home of Martha Washington Pure Food Products". The photo shows a tree with a poster encouraging the lumbermen in the war effort. 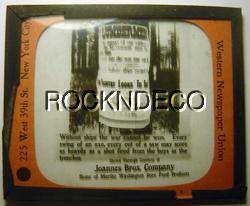 This glass slide was produced by the Western Newspaper Union of New York. The slide measures 3-1/4" x 4". The glass slide is in good condition - the edging tape around the slide pulled off in a couple places . A NICE PIECE OF WORLD WAR I / MOVIE NEWS MEMORABILIA! Postage is $3.50. If you buy additional glass slides, postage will be only $1 for each additional.